Ernest Health, Inc., and The University of Toledo announce the groundbreaking for the Rehabilitation Hospital of Northwest Ohio. The hospital will be constructed and operated by Ernest Health and located on the Health Science campus of The University of Toledo. 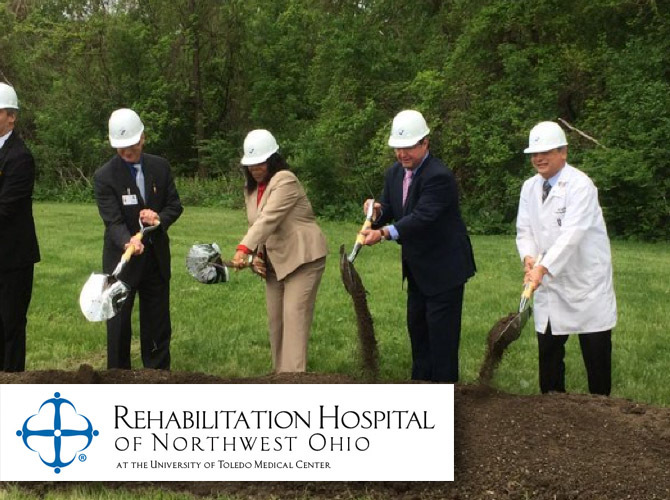 The new hospital, which will be known as the Rehabilitation Hospital of Northwest Ohio, will provide intensive physical rehabilitation services to patients recovering from strokes, brain and spinal cord injuries, and other impairments as a result of injuries or illness. As an affiliate of The University of Toledo, the hospital will provide training opportunities for resident physicians of the university through a physical medicine and rehabilitation residency program and for students through clinical rotations for physical, occupational, speech therapy as well as nursing. “We are excited to work with The University of Toledo and establish our first physical medicine and rehabilitation educational program. It’s been rewarding to collaborate with the university’s leadership to meet this community need.” said Angie Anderson, senior vice president of development for Ernest Health. Ernest Health currently operates 23 post-acute care hospitals, including 15 rehabilitation hospitals that have consistently been recognized as being in the top 10 percent of inpatient rehabilitation hospitals nationwide for care that is patient-centered, effective, efficient and timely. The national ranking is provided by the Uniform Data System for Medical Rehabilitation (UDSMR), a not-for-profit corporation that was developed with support from the National Institute on Disability and Rehabilitation Research, a component of the U.S Department of Education. As part of the agreement between the two organizations, the Rehabilitation Hospital of Northwest Ohio will absorb operations of inpatient rehabilitative services currently offered through the medical center. There will be no interruption of services, and current staff can retain employment with the university or apply for positions at the new hospital. Officials estimate approximately 120 jobs will be created. Ernest Health will break ground on the 49,000-square foot facility at 10 a.m., May 12 during a ceremony on the site located at 1445 West Medical Loop. The public is invited to attend. “I am pleased to welcome Ernest Health and the Rehabilitation Hospital of Northwest Ohio to Toledo. Our community will only be strengthened by the care and support given to Toledo residents by this hospital. Welcome to Toledo and thank you for enhancing our community,” said Mayor Paula Hicks-Hudson.